Definition - What does Standing Half Forward Bend mean? Standing half forward bend is a yoga inversion that strengthens and stretches the hamstrings, and massages the abdominal muscles. This is a popular posture in vinyasa styles of yoga and it is included in Sun Salutation (Surya Namaskara) A and B. In this pose, the body folds forward at the hips with the spine straight. The chest is slightly lifted, creating a gentle arch in the spine as the gaze looks forward. The Sanskrit name for standing half forward bend is ardha uttanasana. Standing half forward bend stretches and lengthens the hamstrings and the back of the body. It increases the strength of the spinal muscles, which is thought to improve posture. It has many internal benefits as well, including relieving menstrual cramps and stimulating the belly, which helps with digestion. This pose can be challenging if the hamstrings are tight, so it can be helpful to modify the posture by resting the hands on blocks or on the shins, or bending the knees. Standing half forward bend should be approached with care by those with neck issues. 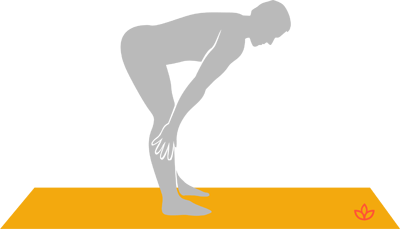 Students with sciatica can practice this pose by taking the feet hip-width apart and turning the toes slightly inward.